The words Kilts and Bagpipes go together like ice and snow, or cat and mouse, they just fit together, don't you think? I am often asked when wearing my kilt, "do you play the bagpipes" to which I have to reply "no unfortunately I don't". Perhaps I should learn, I do actually sing with a choir, but as for playing musical instruments, that's not something that I have so far learned to do. 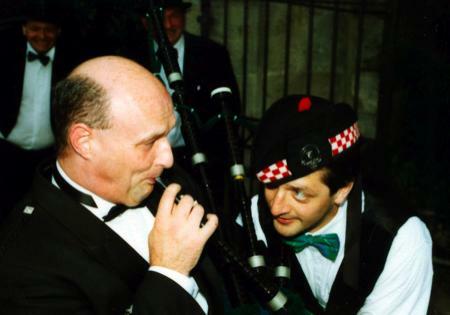 I did once try to get a note or two out of a set of pipes, it was on my wedding day and the piper lent me his pipes as the photographer wanted a photo of me supposedly playing them, you can see the photo below. Although the bagpipes are an ancient instrument, which were played in many parts of Europe and the middle East in many different forms over the last few centuries, they have now become synonymous with Scotland. This is in no small way due to the Scottish Regiments, who during the expansion of the British Empire brought the Great Highland Bagpipes to almost every corner of the world. And these same Regiments trained large numbers of pipers for military service in both World Wars, which helped to create a surge in the popularity of the instrument, a popularity which survives to this day. That popularity together with military tradition sees the bagpipes being played at many military funerals, and those of high ranking public officials. The military connection to the instrument is still very strong in the Royal Regiment of Scotland, as it is in military forces of the Commonwealth countries such as Canada, Australia and New Zealand, and is often played at formal ceremonies. 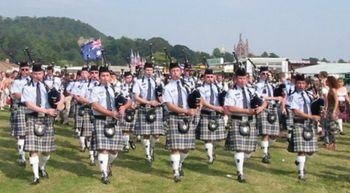 Many police forces in countries such as Scotland, Canada, Australia, New Zealand, America and South Africa have formed Police Pipe bands, and as you would expect wear their kilts with pride. The Tayside Police Pipe band are one of Scotland's oldest, having been founded in 1905. And having played for more than a century they are still going strong. The World Pipe Band Championships take place every August in Glasgow. Below you can watch a video of the Field Marshal Montgomery pipe band taking part in these championships. The event which lasts only one day is run by the Royal Scottish Pipe Band Association, and is attended by several hundred pipe bands who converge on Glasgow Green from all over the world. The fact that they can judge so many bands, and find a winner in one single day is quite an achievement. And as you can imagine the title of World Champion is highly coveted, which is why these pipe bands spend the entire year in preparation and rehearsal. In addition to competing at the World Championships, most of these bands from around the world play at Highland Games in Scotland, during the summer months. So if you decide to take a holiday in Scotland (which by the way I highly recommend) you are almost guaranteed to be able to hear at least one pipe band playing. And believe me when I say the sight of a pipe band marching, their kilts swaying as they go and the sound of the bagpipes is a memory you will retain forever.